It seems if you’re one of the lucky few planning to buy a $375,000 Lexus LFA, you have the option of the considerable bonus of a day at the Infineon Racetrack in Sonoma, CA to learn how to handle the 4.8-liter V10 supercar. Scheduled for March 8 to 15, the program will pair confirmed and potential buyers with professional drivers in a session blending racing theory, track laps, performance limit exercises and technical demonstrations. Infineon Raceway is a 1.99-mile racetrack with 10 turns and 160 ft of elevation change. It is the home of NHRA Drag Races and IZOD Indy Car events among others. Lexus officials are certainly proud of this exotic sports car and they have good reason to be. 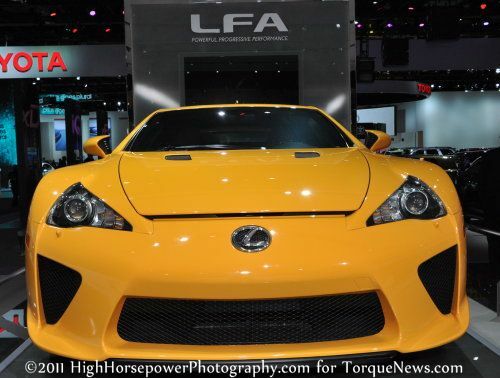 After the October 2009 introduction of the LFA, its engine was named among the "Top Ten Engines" of the year in 2010 by Automotive Engineering International, the global magazine of the Society of Automotive Engineers. The following June, Robb Report listed the LFA among the “Best of the Best Sports Cars,” in special issue representing an entire year's search for excellence in every aspect of the luxury lifestyle. The car has a Lexus defined top speed of 202 mph and is reported to achieve zero to 60 in 3.6 seconds – you have to admit that’s pretty darn quick. So that’s the number of lucky son-of-a-guns who will have the option of paying $3,500 for this one day event during a week in March. The first models arrived in January and the last of them will be delivered by early in 2012. Apparently most of that 170 are already sold so the phrase hurry supplies are running out applies, too. Now you’ll have to excuse us – something tells me I need to buy a Powerball ticket in exactly 12 minutes at the local 7-11. Maybe we’ll see you there after all.